General Electric Co. (NYSE: GE) is the current poster child for “most hated stock on Wall Street.” And it proves once again why it pays big time to monitor share purchases by corporate insiders. I harp on this all the time. So does my colleague Brian Christopher with the growing ranks of people who get his advice at Insider Profit Trader. We follow insider purchases for good reason: It works. Back on December 5, GE’s $7 stock price showed it was about as unloved as a company can be on Wall Street. Analysts hated it. Me? I noted GE insiders recently purchased nearly $3 million in stock. Since then, GE shares are up nearly 40%. As I’ve told my subscribers at Total Wealth Insider, insider buying doesn’t guarantee a stock will go up. But it certainly increases the odds. A month’s worth of data doesn’t mean the coast is clear and it’s all unicorns and rainbows from here, of course. As GE sells some assets and spins off others, it becomes a fundamentally more focused company. One with a smaller asset base than the old “conglomerate GE” too. But when insiders — executives, board members, institutional investors — commit to buying shares with their own money (as opposed to grants and options compensation), it means they’re putting their own money at risk along with shareholders. There’s no better demonstration of corporate leadership, in my book. So, getting back to GE. What about now? Sure, it wouldn’t surprise me to see the stock give back some ground. The good news — GE has plenty of cash flow to meet its obligations, with no nasty surprises in its numbers — is on the table now. That gives plenty of time for the bad-news bears to go to work on the stock once again. And it’s important to note GE still has its challenges. As JPMorgan Chases’ analyst noted, the company did not provide official guidance on exactly how much money the company would earn this year. With all that in mind, there’s no shortage of analysts’ calls for GE to drop back to $6 or $7 again. 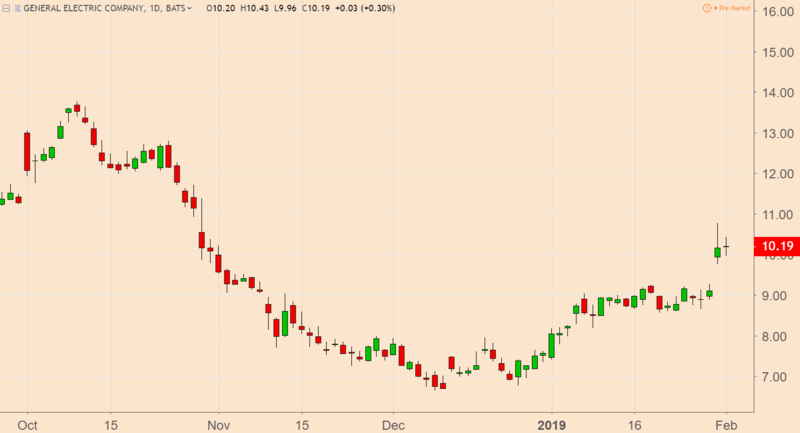 The shares may well drift in that direction for a while, especially if the broader market is weak and investors temporarily lose their resolve on turnaround stories like GE. But I wouldn’t let analysts’ fence-sitting keep you from waiting too long. For one, think about GE’s insiders. They’re not buying to flip the stock next week or next month, but with a much longer holding time. And second, as I’ve observed in my years as a financial journalist, analysts tend to miss one important factor in their reports (probably because it can’t be easily put in a spreadsheet). Stocks (and markets) tend to anticipate future events. In other words, when GE’s stock fell 80% in 2017 and 2018, it was discounting the future events that Wall Street analysts are still worrying about now. The stock’s rise so far may have some GE analysts puzzled. But the “smart money” buying it now isn’t looking at today’s worries — it’s looking forward to future positive announcements from CEO Larry Culp and his executives. At some point analysts will no doubt declare GE’s existential threat over. By then, the shares will likely be much higher.